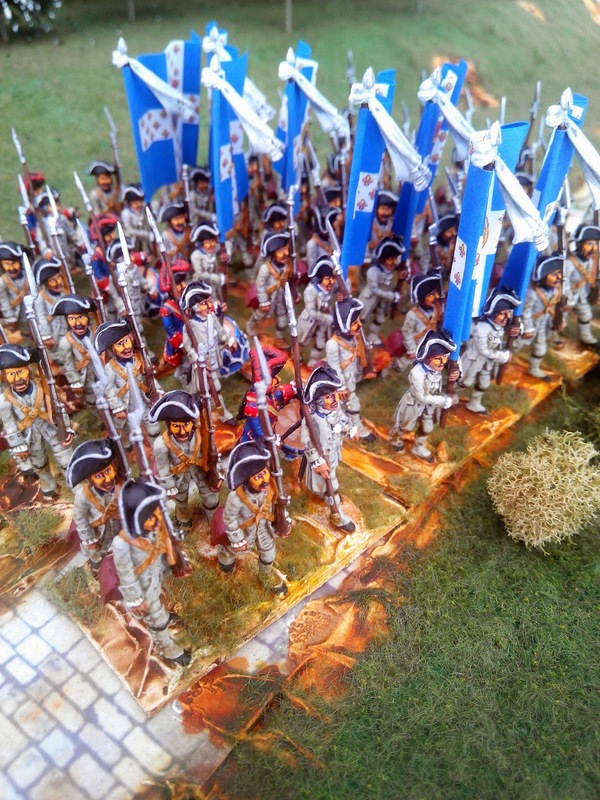 Here are four battalions of the Grenadiers Royaux. 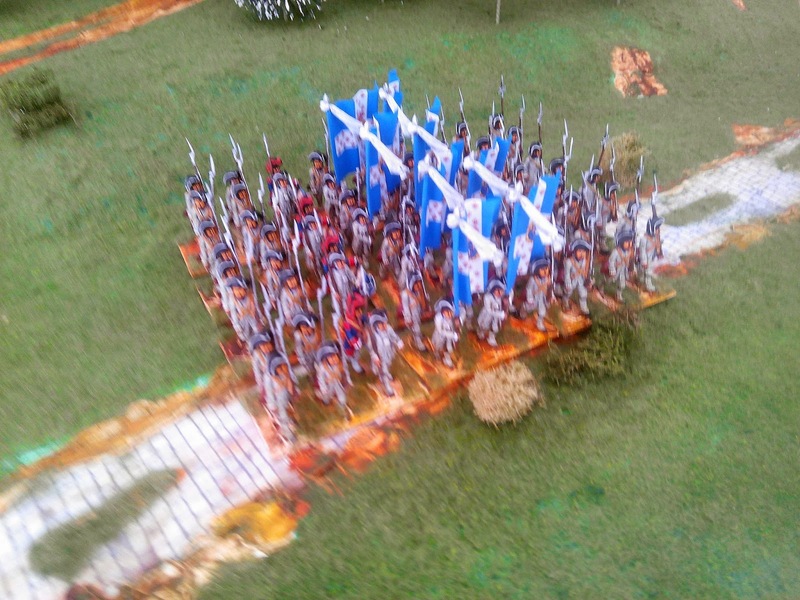 Each battalion is 3 bases of 6 so 18 figures for a total of 72 figures all from Black Hussar. 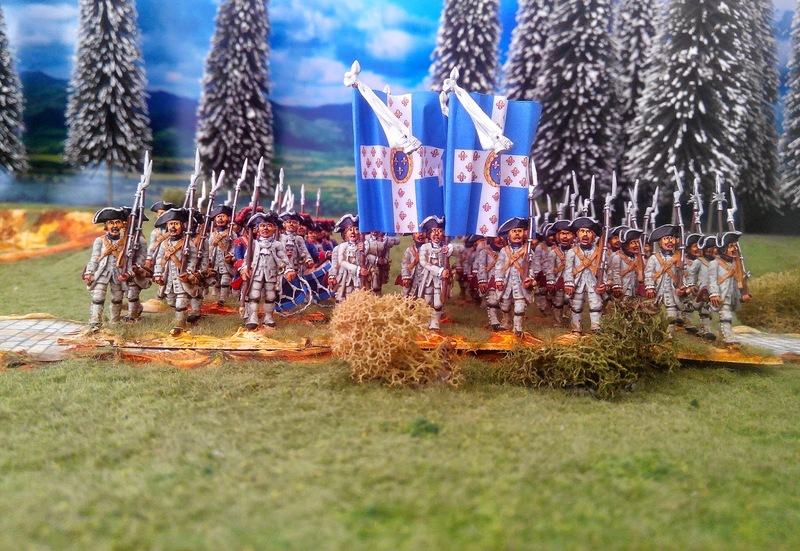 They are fantastic figures – easily the best 25/28mm SYW French figures available at the moment. 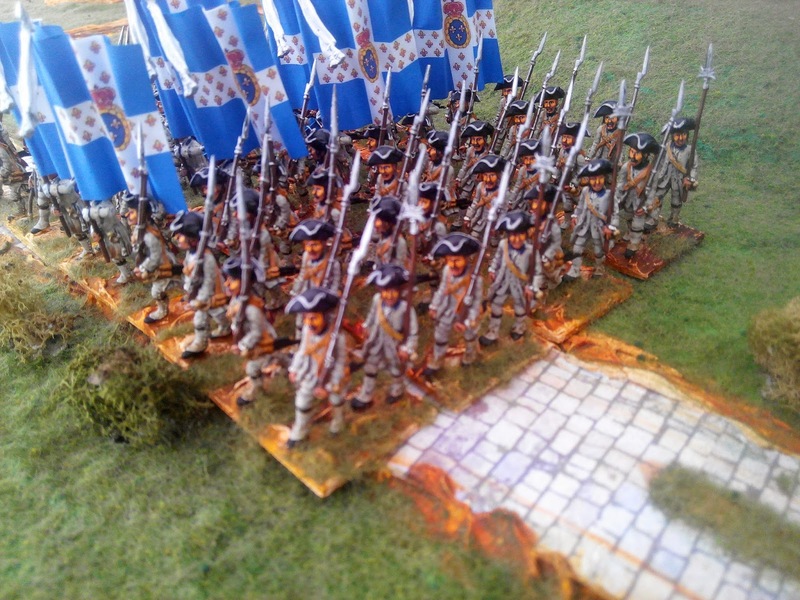 The figures are a real pleasure to paint although these uniforms had no colour besides the blue collar that is almost invisible. The drummers have plumes on their tricornes that are fun and the scarves on the flagpoles suggest the correct way to unfurl the flags. Talking of flags I have not gone with the suggested ones on Kronoskaf but these rather smarter ones from another source. 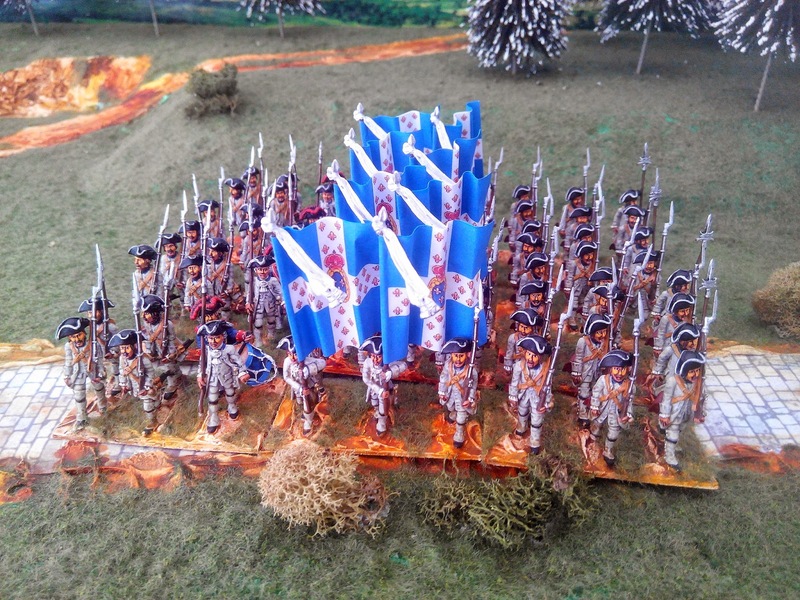 There were 11 regiments of Grenadiers Royaux, each of 2 battalions, so you could field an awesome reserve division of all 22 battalions if you wished although as far as I know this was never done. A much smaller number of these battalions served at Minden with the Grenadiers de France – 4 or 8 battalions depending on sources again. All the regiments looked exactly the same – the white or pale grey coat, no facing colours, blue collars and silver/pewter buttons. 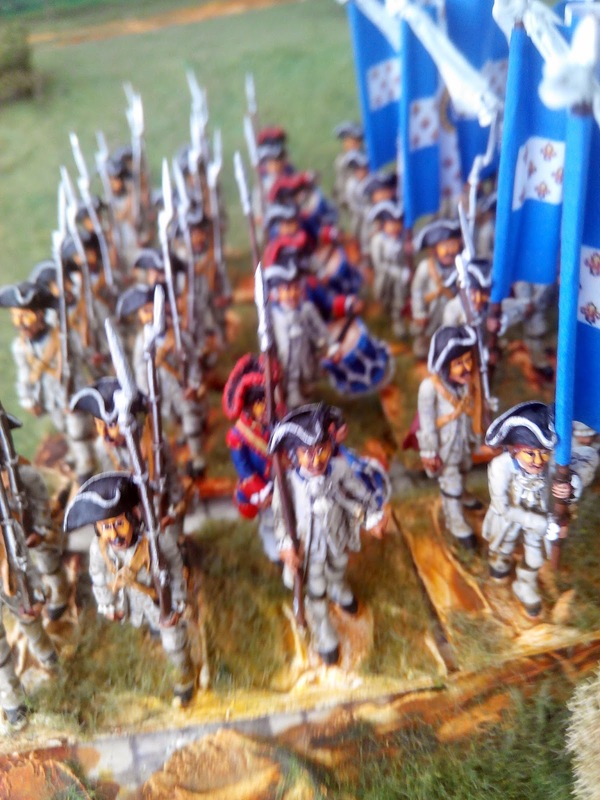 These are in fact Grenadiers Royaux de Chatillon and of Chantilly, but only because I like the names. Lastly, I hope you like the new terrain I have made. The trees came from China and, bizarrely, had snow on them although the pictures when I bought them did not. They wanted to jazz them up! Very nice - never realized how imposing the standards must've been on the battlefield! Marvellous unit, indeed! And beautiful flags - very impressive!